← Skill Training App – Visual Motor Fun! I stumbled upon this free electronic app for stringing beads and thought this would be a fun electronic activity during the doldrums of winter. I believe most tablet apps support development of visual motor activities but leave much to be desired for fine motor development. Both apps and hands on activities both have their place for use at home or in therapy when used in balance or if apps are used as a reinforcement, reward or as a visual perceptual/visual motor activity as needed. So this review provides both, review of an app as well as suggestions for beading activities for fine motor development. Although OT’s working with kids will not find a lot that is new about bead stringing – check out Krista Whitaker’s Pinterest link below for some fresh ideas. 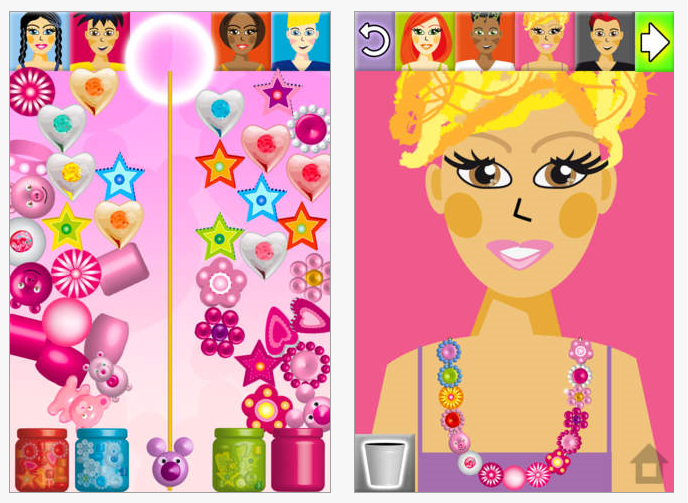 Kids Beads is a free iOS app for iPhone/iPod and iPad that is a fun activity for kids ages 3-8. The visual motor demands are limited (depending on the size of the device used), making this an easy and fun app for young kids when using an iPad. More precision to select a bead is required on an iPod or iPhone. Jars of different types of beads are offered requiring sliding beads on a string/ post or rod to make a necklace. The jars of colored beads (red, blue, green and pink) offered provide similar beads of different colors that can be opened at any time to slide on the string/ post. Create a string of random beads or encourage pattern sequencing of the beads. Run out of the shapes you are sequencing? Tap another colored jar and the same shapes of different colors are offered. Shape concepts can also be worked on (circle, rectangle, stars, hearts) as offered by the beads provided. When the necklace is done, tap a person (top of screen) and the necklace appears on the selected person. Tapping the bucket restart Sound and music volume are the only options available within the app. No emailing or printing options are available in the app either, however taking a screenshot (hold home and sleep/power button simultaneously) is always an option to publish the creation. I found this a simple, fun visual motor activity that might be more appealing to girls than boys. Supervision or coaching to make this a therapeutic, visual perceptual/sequencing task. It has limited fine motor demands (as many tablet apps) requiring only touch and sliding objects on the screen but the interface is colorful, appealing and fun. What kind of hands on activities might be encouraged as an extension with the use of this app? If this is motivating get out beads or pop beads of appropriate sizes to create their own real necklace! You may have beads readily available or check your local craft store for beads of all different styles and sizes. Pop bead were always a favorite choice of activity for students needing opposition of thumb and fingers, fine motor dexterity and distal strength. Size of the pop bead needs to be chosen carefully to not cause collapse of the thumb when opposing (especially with resistance). Beads come in many different fun shapes and sizes from Small Bead Assortment to Jumbo Lacing Beads and large to small pop beads depending on ability. Looking for some low-cost beading options for kids? Education.com provides suggestions for Homemade Beads: 3 Ways – using pasta, clay (made with flour) and paper to create beads. 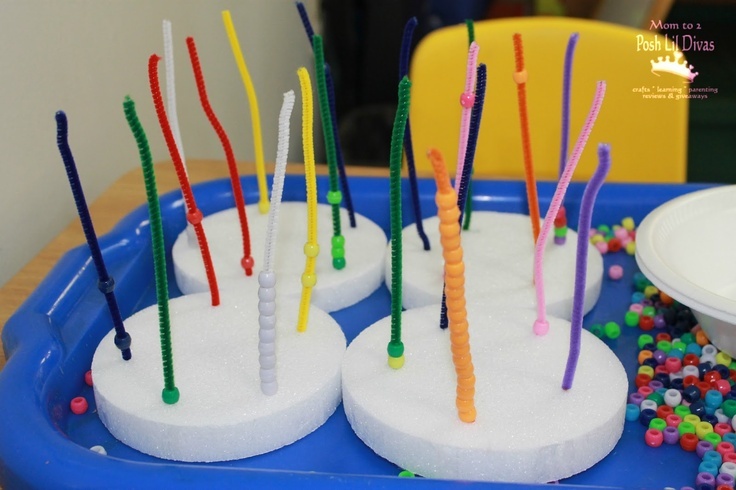 If you have a child with immature skills, using a pipe cleaner can do the trick for beginning bead stringing (a standard toolkit item for OT’s working with young students). Visit Krista Whitaker’s OT’s Pinterest for some great bead stringing (and many more fine motor/bilateral coordination) activities. On the topic of facilitating opposition for some students lacking this skill, thumb supports (such as Benik’s splints or McKie Splint for support of thumb MP joint) can also be used to help facilitate opposition. Whether performing hands on activities or using the iPad, a support might be considered if opposition is a challenge along with mobility and stability activities for the student. Use of a stylus fit to the student such as the MacGyvered Bulb Grip Stylus or The Pencil Grip Ergonomic Stylus might support opposition when using the iPad. Don’t forget positioning of the iPad to facilitate wrist extension and refined finger use as tolerated. So use of an app or hands on tasks using beads? I believe both can have their place by balancing the needs and the skills of the client during therapy. What are your thoughts? This entry was posted in App Reviews, Apps for OT's, Early Childhood, Elementary School, Fine Motor Development, Free apps, iPad, iPhone, iPod, Just for Fun, Occupational Therapy, Pediatrics, Primary Grades, Special education, Stylus, Visual Motor, Visual Perception. Bookmark the permalink.